Drilling Large-Diameter Holes. (c) 2007 Chris Baylor licensed to About.com, Inc. When drilling large-diameter holes with a spade (or paddle bit), hole saw or other large diameter bit, one of the most common problems occurs when the bit "blows through" the back side of the stock, tearing the face of the stock, leaving a very ugly problem to deal with. However, there are two very simple methods for solving this troublesome issue. First, try clamping a block of hardwood to the back side of the stock before drilling. When the bit approaches the end of the cut, it will be far less likely to blow through with another piece of wood to drill. However, if the stock placed on the back side is softer than the work piece, or if it is not securely clamped to the work piece, tear out can still occur. Another, perhaps simpler, method is to drill half-way through the stock, until the pilot hole just penetrates the back side of the work piece, then flip the work piece over and drill back toward the front side. 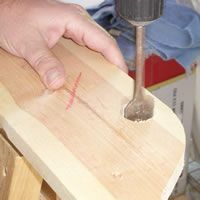 In this manner, any possible blowout would occur in the middle of the stock as opposed to either edge, leaving a much cleaner cut on each side.